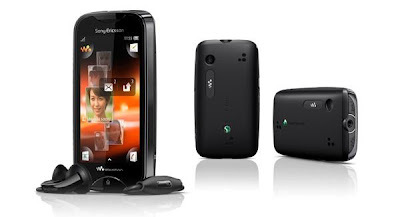 Sony Ericsson has managed to get a 3-inch display into a neat sized body, with a matt rubber finish on the reverse. A fully charged battery lasted all day, with Wi-Fi on, but then there’s not much else to use the power. The sluggish touch display is annoying, although the Wi-Fi facility means you get faster web browsing than on most handsets at this price. Think back to the 90s, and you’ll remember that Sony Ericsson’s Walkman handsets were pretty cool. They looked stylish, they were easy to use, and they were just excellent, really. But then along came Nokia and its 8210 (and many other phones) and then Sony dropped the bombshell that it was merging the Walkman into its Entertainment Unlimited handsets. But, now, the Walkman has returned in the shape of the Walkman Mix, but can it still live up to its original reputation? This handset may have a name that’s a blast from the past, but you’ll be disappointed if you’re expecting an old-style grid-based menu. Here you’ll see the homescreen is a replica of the interface seen on Sony Ericsson’s Android handsets – this means you’ll be treated to four static shortcuts, one sitting in each corner and covering music player, texts, dialler and phonebook. To access all programs, you tap the arrow at the bottom of the display – however you won’t see all programs, because any shortcut that is situated elsewhere, including camera and music keys, is not included in the menu. Slightly odd, but you get used to it eventually. To look at, the handset is cute rather than stylish. It is a neat size and has a rounded body, with a matte rubber finish. It has a three-inch capacitive display, and beneath this sits a big home button. The dedicated music key is placed on the top of the device, along with the 3.5mm audio jack. The snapper is a 3.15 megapixel model, with a dedicated button to fire it up. Don’t expect a flash though. Even the most basic handsets seem to have touchscreens nowadays, but in all honesty we think the Mix Walkman would be more effective with a keypad. It was sluggish when swiping through the programs menu and we kept selecting programmes we had no desire to open. Where it really proves frustrating though is when texting. The diddy keyboard is squashed, even in landscape mode, and of course there’s no QWERTY keyboard. Instead, you have to resort to typing T9 style – pretty annoying on a less than responsive touchscreen. There are some nice touches – we like the Friends app, which lets you choose five favourite contacts and opt to contact them using text, email, Facebook, Twitter or calling. However, while the handset has the benefit of Wi-Fi, there are no social network apps – this just takes you to mobile versions of the relevant sites. So, while it’s not great for social networking, the Walkman Mix does offer quite a speedy internet experience, especially compared with other handsets in the same price range. The onboard camera is reasonable, although you won’t want to be taking images in lowlight as there’s no flash. However, daylight snaps proved clear and offered decent colour. The shutter is pretty speedy, too. With a name like Walkman, you might be expecting a decent musical experience, and while Sony has ensured that there are plenty of ways to get to your tunes, the overall sound isn’t that great. Bass is thin and crackly and any extremes of sound just don’t translate well. We weren’t impressed with the bundled headphones , but even with our own we weren’t overawed by the sound quality. It seems odd that a handset that is supposed to have music at its core has such poor sound quality. While there is a dedicated music player button, and nice touches such as playlist creation, this means little if the music is not good to listen to. The touchscreen is a nice addition in this budget range, but doesn’t perform well enough – making texting too sluggish – not a good trait for a phone aimed at the younger user. All in all, the Mix Walkman is a basic handset that would have done well to have been rather more basic.